Back in the late 1940s, Ford of Canada decided to invent a new automobile company name for rebadged Mercury cars. That name was Monarch, and it died twice. First, with the introduction of Edsel, FoC killed the Monarch name, but brought it back when Edsel was a flop. Then, it died for good in 1961 when the Galaxie was introduced at a similar price point. Though Mercury did later use the Monarch name for a rebadged Ford Granada. 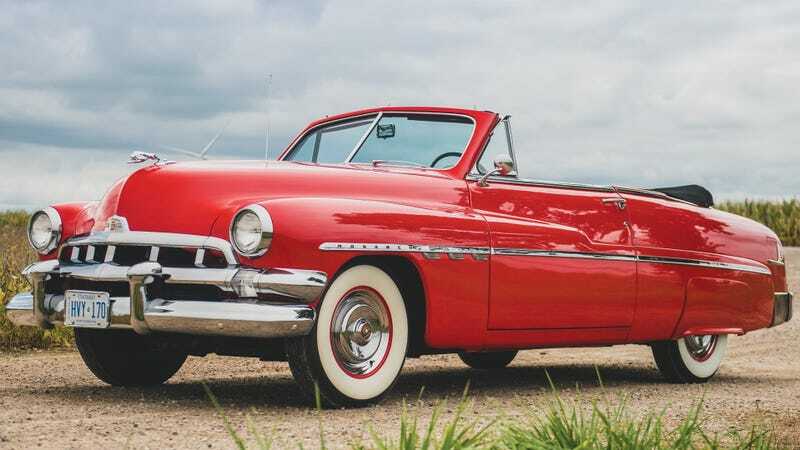 Similar in nearly every aspect to the Mercury “Bathtub” V8 cars of the early 1950s, the Monarch simply received a re-trim with less expensive materials. With different bumpers and a different hood ornament, the Monarch is a familiar face that has been subjected to minor rhinoplasty. The chrome side decos are slightly different as well, and the Monarch foregoes the rocker trim of the Mercury. Canadians were still a bit cash poor following WWII, and the import tax on cars wrecked Ford’s bottom line in the market. The introduction of the Monarch allowed Canadians to have upper crust style with a mid-level price tag. Sales of the Monarch were slow, as they were still quite expensive to purchase in Canada. The convertible, in particular, was an extravagant purchase in the cold North. With short summers and harsh winters, not many people found use for a drop top family car in Canada. Of the few that were sold, only four remain. This particular car was a piece of the Lloyd Needham collection, and is coming up for auction next month at RM Sotheby’s Hershey auction. It was restored back to original condition in 1995, and the restoration is starting to show a bit of wear, but used and usable is how I like cars, and this one is still quite nice. The chrome and black canvas soft top really pop against the Fez Red bodywork, and even in poverty spec, it’s quite the stately thing to ride around in these days. In a sea of belly button—as in everybody has one—hot rods and muscle cars at the cruise in, you can be a truly unique and slightly oddball automotive connoisseur in something like this Monarch. It’s not exactly the car of Kings and Queens, but it’s an interesting conversation starter. The guys down at the soda jerk will never believe what a cool ride you’ve got.